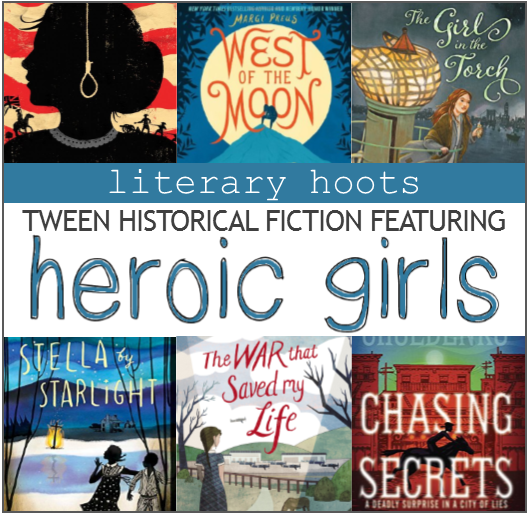 There have been some pretty great middle-grade historical fiction novels released of late that I think show heroism at its finest—particularly from some talented and brave young girls. Here are my seven favorites. Sophia Calderwood, despite witnessing the execution of Nathan Hale for espionage, will do anything to avenge the death of her brother—including spying on the British. What she doesn't expect is to uncover a plot so shocking, few believe her. Which means she must put a stop to it herself. This book is really the reason I wanted to write this book list, because I love Sophia's courage. Plus, there's so much actual historical content that you may just learn something new. Which is really what this list is all about. Astri, a young Norwegian girl, is desperate to join her father in America, but her cruel aunt and uncle sell her off to a deformed goat farmer. She makes a daring escape, reunites with her younger sister, and they set off on a journey to America through field and forest, and in and out of folktales and dreams as they steadily make their way east of the sun and west of the moon. Preus was inspired by her own great-great-grandmother's emigration from Norway, but interweaves fairy tale into the heart of the story. As such, it's quite the fantastical historical fiction. But still, Astri—like many other immigrants of the time—courageously faces some real troubles before making it America. See my original review here. While West of the Moon may be about the immigrant journey, this novel is one girl's experience when she finally makes it to America. When officials try to send young Sarah back to her home country—since she has no relatives to help her in the U.S.—she makes a daring dive off the back of the boat and swims to Lady Liberty. Sarah then must find the courage and innovation to create her home in a new country on her own. It's an amazing look at immigrant-filled New York at the turn of the century. See my original review here. Ryan, similar to Preus in West of the Moon, also interweaves fairy tale into her historical fiction account of three very different characters dealing with the troubles of their time. I particularly enjoyed the account about Ivy, a young Hispanic girl growing up in California when many rights were denied to those of her race. She finds her strength in family and music, and—well, you should just read the book. Its amazingly complex, yet lovely storyline brings appreciation for all sorts of heroes in history. See my original review here. Speaking of race relations, this novel is about a girl named Stella growing up in the segregated South—Bumblebee, North Carolina. And one night, she sees something terrible: the Klan is back and burning a cross. Based on her own ancestor's experiences, Draper has her characters dealing with all sorts of troubles in the Depression-Era South. The novel is more a collection of experiences Stella has to prove her courage. See my original review here. Ada has never been outside of her apartment because her mother is too ashamed of Ada's club foot. But when it's time to ship her little brother, Jaime, out of London to avoid the war, Ada sneaks out with him. They end up the home Susan Smith—who does not want kids—and Ada is faced with all sorts of new and challenging circumstances. This novel presents a much more subtle sort of courage, as Ada faces the challenges of her own past. It's a fascinating read. See my original review here. Lizzie Kennedy would rather be visiting patients with her doctor father than sitting through another course at Miss Barstow's—but such pursuits are unsuitable for girls. And yet, when rumors of the plague arise, Lizzie is determined to investigate and, in turn, discovers a dark side to San Fransisco. First off, the amount of research that went into this book is amazing, making for a great learning experience. And, of course, Lizzie's character faces a lot of interesting challenges. See my original review here.